Have you ever sent an email or text that you wish you could take back and delete forever? That’s not possible on the open web. But we now know that Mark Zuckerberg has the power to reach into every single Facebook inbox and delete messages that he’s sent. Zuck and other executives at Facebook have reportedly used that power multiple times. The practice only came to light when Facebook users started to examine the information being stored by the social media company using the Download Your Information tool. According to Techcrunch, some people who have exchanged Facebook messages with Mark Zuckerberg have noticed that their old messages from Zuckerberg were gone. Messenger has a feature that allows users to send messages that delete automatically, but that was only introduced in 2016. 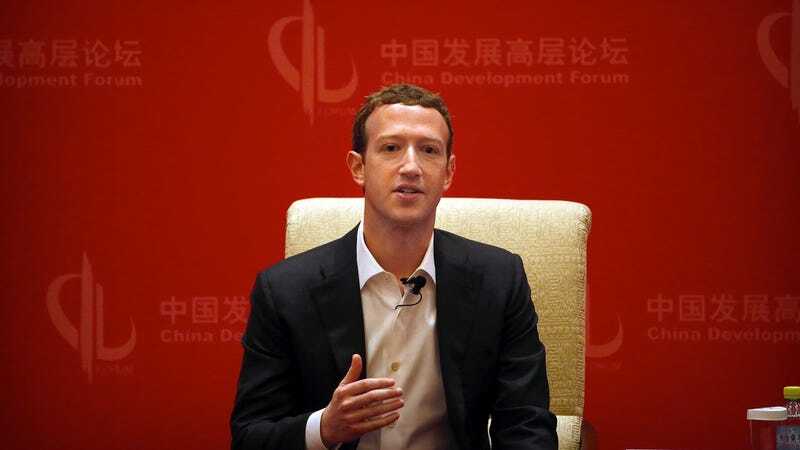 Users report that messages with Zuckerberg from as far back as 2010 have been deleted remotely, leaving only the recipient’s side of the conversation. But it wasn’t just Zuckerberg who was deleting his sent messages. A Facebook statement makes it clear that multiple executives at the company have probably done this. After Sony Pictures’ emails were hacked in 2014 we made a number of changes to protect our executives’ communications. These included limiting the retention period for Mark’s messages in Messenger. We did so in full compliance with our legal obligations to preserve messages. Bringing up the Sony hack might elicit some sympathy for this idea that Facebook executives should be able to delete communications they have with outside parties. But no one outside of Facebook’s top brass have this luxury, as far as we know. And even if it’s not illegal, it seems like an enormous betrayal of reasonable user expectations about how online communities should work. Again, we’ve all sent an email or message that we regretted. But once it’s in the hands of the recipient, that person has control over the message like you would a hand-written letter on paper. The sender doesn’t get to take it back with just a click. Or, at least, they shouldn’t be able to do that according to established norms. All of this news comes as Facebook faces intense scrutiny from both the public and governments around the world over its mishandling of user data. It was revealed in March that the private data of 50 million Facebook users was given to Cambridge Analytica, a company that used that information for targeted advertising during the 2016 presidential election. Facebook has since admitted that it was probably more like 87 million people and that every single user has likely had their public profiles scraped. Zuckerberg is scheduled to testify in front of two Congressional committees next week. The Facebook CEO will be in front of the Senate Judiciary and Commerce Committees on Tuesday, April 10th and then visiting the House Energy and Commerce Committee on Wednesday the 11th. Zuckerberg has declined to speak in front of the UK House of Commons despite repeated requests for him to travel to London. Facebook’s Sheryl Sandberg gave multiple high-profile interviews yesterday to media outlets like Bloomberg and NBC News. In an interview with NPR, Sandberg blamed the company’s failures to protect the privacy of its users on idealism. “We really believed in social experiences. We really believed in protecting privacy. But we were way too idealistic. We did not think enough about the abuse cases,” Sandberg told NPR. We still have a lot of questions about Facebook’s practice of remotely deleting the communications of its executives. How many people at Facebook have the ability to delete their sent messages? Is this being done automatically or on a case-by-case basis? We’ve reached out to Facebook for answers and will provide an update if we get any. And if you have any evidence that Zuckerberg or other Facebook executives have been tampering with your inbox, drop us a line: novak@gizmodo.com. Update, 12:29pm: In a strange statement to Techcruch, Facebook now says that it’s thinking about rolling out an “unsend” feature to all its users. Facebook still hasn’t responded to Gizmodo’s questions about how many people at Facebook have been deleting their sent messages. How many Facebook employees have been scrubbing their messages remotely and why? We’d love some answers. Give us a ring, guys. You know our number. Obviously.